Spend your NYE being wined and dined before dancing through to the early hours of 2019. 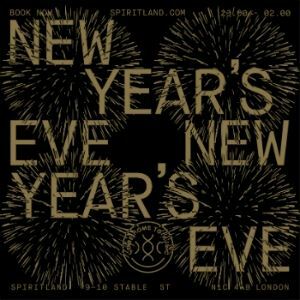 Spiritland have two options for the evening – a full three-course meal followed by dancing or a late-arrival option for the party only. If you’re in a treat-yo-self mood the menu will tempt you in, with starters of poached beets and sea bass ika mata, mains of stuffed aubergines or beef onglet and desserts of coffee delice or pecorino with honey and almonds. When you’e ready to hit the dancefloor you can enjoy the sounds of Norsicaa and Kyri on the club’s world-class sound system with plenty of fizz to when midnight comes around. The dinner starts at 8pm, the party at 11pm and finished at 2am.